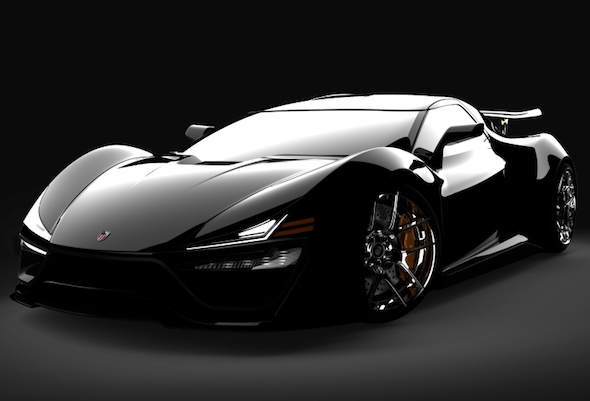 America is preparing to enter a new contender into the exclusive hypercar market, in the form of the Trion Nemesis. This striking machine is the work of start-up company Trion Supercars, which claims the Nemesis will boast 2,000bhp – nearly twice as much as the Bugatti Veyron Super Sports, which is currently the world's fastest road car. The root of this eye-watering power output is a heavily turbocharged 9.0-litre V8 engine, mounted behind the cabin. Claimed performance figures are suitably ludicrous, with a 0-62mph time of 2.8 seconds and a projected top speed of 280mph. Should these claims prove true, the Nemesis will outrun the latest crop of European hypercars, including the 1,322bhp Koenigsegg One:1, which has a top speed of 273mph. The Nemesis isn't just about raw power, however. Like many of its hypercar contemporaries, it is built around a carbonfibre monocoque, with many of the body panels also fashioned from the lightweight wonder-material. It also features F1-style pushrod suspension and active aerodynamics to maximise its handling capabilities. Unlike America's previous Bugatti challenger, the SSC Ultimate Aero, the Nemesis is four-wheel-drive, to effectively transmit that tyre-shredding power to the Tarmac. An eight-speed sequential manual transmission is fitted as standard, as are huge carbon-ceramic brakes, reports Autocar. Inside, drivers will find a cabin suitable for taller drivers, which has been kitted out with a digital dashboard and wireless Internet connectivity. Clearly having a particular buyer in mind, Trion has also seen fit to ensure the Nemesis can accommodate a set of golf clubs in the boot. Trion Supercars describes itself as "a challenger to European dominance of the prestigious exotic supercar category". However, the Nemesis is some way from becoming a road-going reality, with the first prototype models not expected to be completed until early next year. Eventually, a production run limited to just 50 units is expected, with each sporting a price tag of around $1million (£619,000). What do you think of the Trion Nemesis? Would you buy a hypercar from a new company, with no proven race or engineering pedigree? Have your say in the comments section below.